tri-Ace Inc. Research and Development Department. 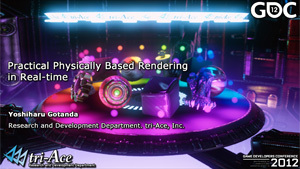 The Research and Development Department in tri-Ace Inc. 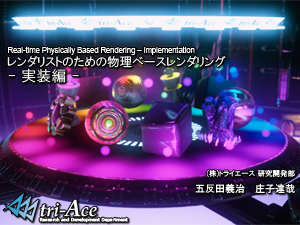 This page is for the Research and Development Department in tri-Ace Inc.
We always welcome programmers and technical artists to our R&D Department. 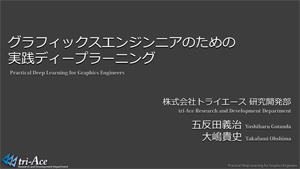 If you would like to work with us as a graphics programmer, engine programmer, network programmer, server programmer, infrastructure engineer, physics programmer, AI programmer, tool programmer, some technical programmer or technical artist, why don't you contact us (research at tri-ace.co.jp) right now? 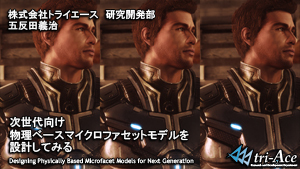 Even if you are a non-Japanese-speaker, it doesn't matter. 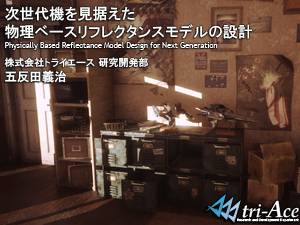 If you are interested in our company or R&D, please feel free to contact https://www.tri-ace.co.jp/en/contact/index.php or research at tri-ace.co.jp in English or Japanese. Link to Compute Entertainment Developers Conference. Link to Android Bazaar and Coeference. Some equations were wrong and fixed (Sep 2, 2013). 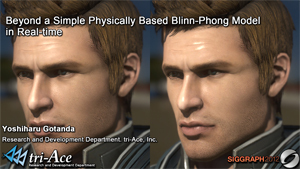 The expression about how to make albedo texture by hand in the slide 35 was changed. There were errors in equations of the Oren-Nayar simplification in course notes and slides and the latest files fixed these errors. Since our implementation was correct, graphs and screenshots in the materials were also correct. (Oct. 31, 2012) Thanks James Canete for pointing out. 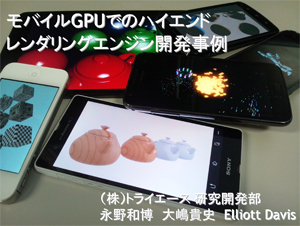 Link to Game Developer Conference. 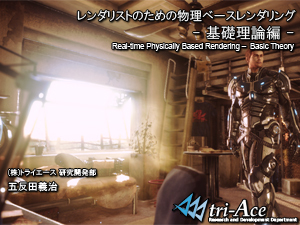 "tri-Ace Technical Demo Trailer 2011"
The video demonstrates "Physically Based Rendering version 0.1" using our game engine. This video is not related to our developing titles at all. 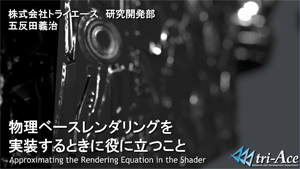 If you would like to know further technical details of the video, check here. Link to Computer Entertainment Developers Conference. 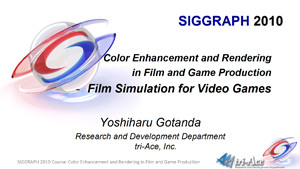 sRGB value of 18% gray was ambiguous in the original slide, it was corrected in this version. 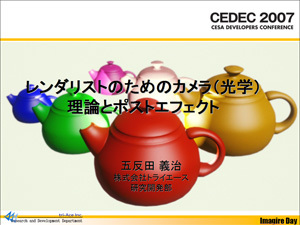 Link to CESA Developers Conference. 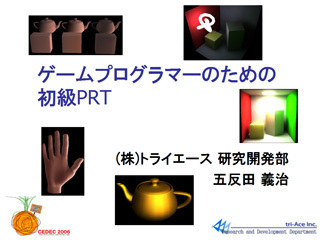 These are course notes and slides for SIGGRAPH 2010 Course "Color Enhancement and Rendering in Film and Game Production"
These are course notes and slides for SIGGRAPH 2010 Course "Physically Based Shading Models in Film and Game Production"
In the slide for CEDEC 2009, refractive indices of some materials were inappropriate. 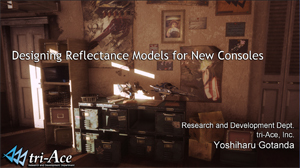 Now new slides are available with updated refractive indices. 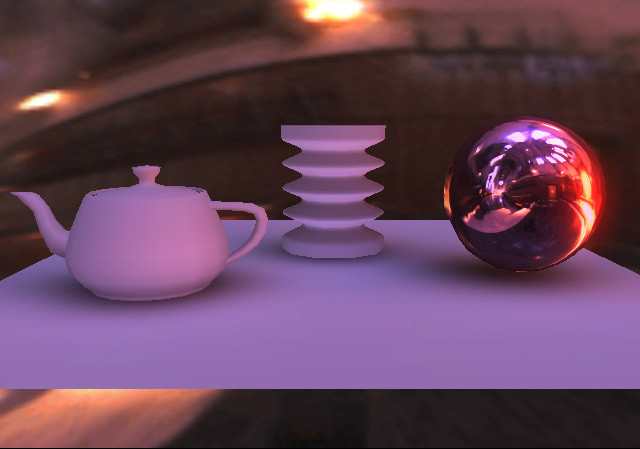 This presentation mainly contains an overview of our flexible shader management system and physically-based camera simulation. 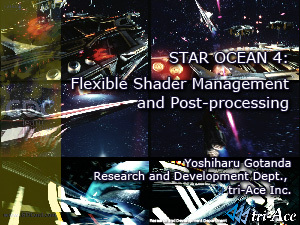 More details in these slides are also covered in our previous presentations for CEDEC 2007 (about the film simulation and some lens simulations) and CEDEC 2008 (about the flexible shader management). However, unfortunately, they are written in Japanese. 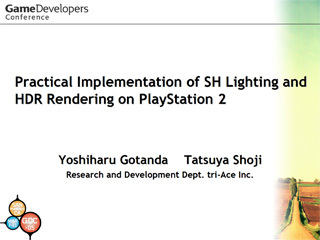 We found the lens equation shown in the slide wrong and updated the slide from GDC version. 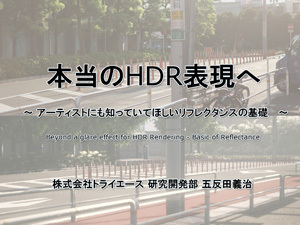 Thanks for pointing out by Mr. Masaki Kawase. Link to Game Developers Conference. 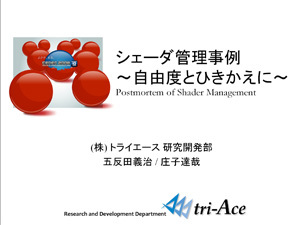 These slides are part of the session. 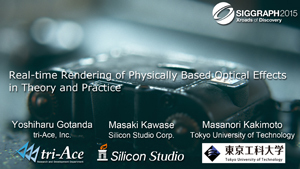 The different topic was also presented by Mr. Masaki Kawase in the same session. 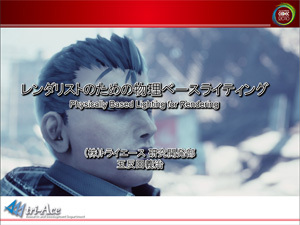 His presentation slides are here and they are excellent. So you must check it! Full length version (ppt file) These slides have been updated from the proceeding CD-ROM of GDC. 2005-18 ©tri-Ace Inc. All rights reserved. 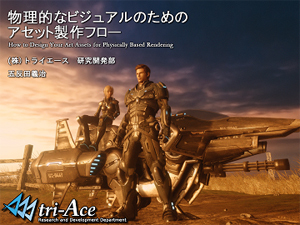 If you have questions regarding the information on this page, please contact "https://www.tri-ace.co.jp/en/contact/index.php".